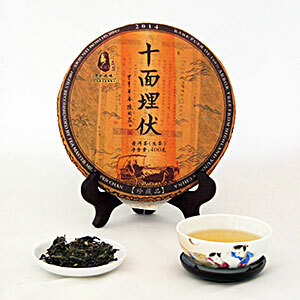 The name of this tea derives from an event in ancient history during the war between Chu and Han Kingdoms when tens of thousands of horses galloped on warring grounds. Armies from both sides each staked out their ground and attacked with different strategic tactics deemed to surprise the other side. This tea is reminiscent of these strategies. The first sip of the tea may seem plain but the next sip will arouse a feeling of surprise. Subsequent tasting will confirm the penetrating and layering of the tea. Master Vesper Chan created this blend by choosing leaves from various mountains in the Lincang tea producing area. Available in individual cakes or a 10-cake tung of 2016 Commemorative Raw Pu-erh inside attractive packaging.